An object of blunt force and breath-catching beauty, Snowpiercer plays what-if with a familiar doomsday scenario: What if Noah's ark never found dry land again? Would the animals turn on each other? 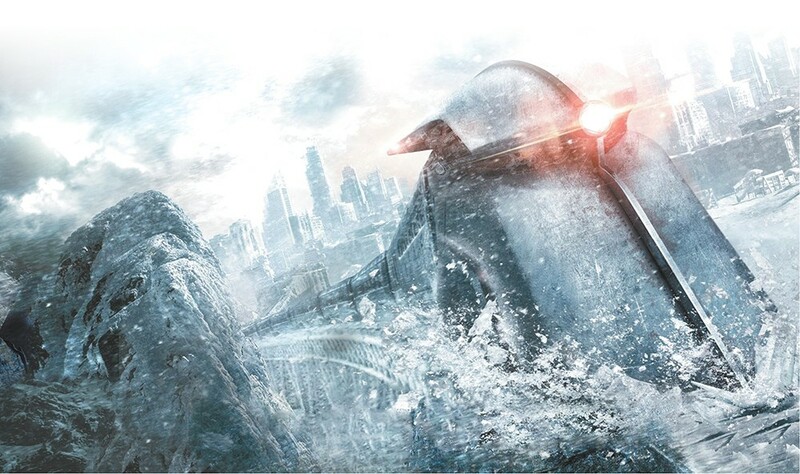 In this English-language debut from acclaimed South Korean filmmaker Bong Joon-ho (The Host, Mother), set in 2031, some 17 years after a failed experiment to counteract global warming initiated a catastrophic new ice age, a train powered by a perpetual-motion engine crosses the world on a continuous track. Humanity is now extinct, save the couple of thousand souls aboard the titular train, a fixed ecosystem with finite resources — although "soul" is a loaded word to use to describe a population reduced to its most basic, and base, instincts. Working from the French source graphic novel Le Transperceneige, Bong and his co-writer Kelly Masterson (Before the Devil Knows You're Dead) use the train's top-down layout to dramatize the class divide. At the front of the train reside the pampered first-class passengers, while in the very back, the poor are penned in like cattle and plundered like a junkyard whenever first-class is in want of a classical violinist or sous-chef. Primed for rebellion, the steerage class rallies around a reluctant leader named Curtis. He's played by Chris Evans, who flexes some of the same muscles (deltoid, jaw) as in his day job as Captain America, but subverts the uncomplicated action heroics of the Marvel movie cycle for a much grimmer meditation on heroism here. Bong's confidence in his leading man to carry the third act — which includes a crucial tight-framed, unbroken monologue — is rewarded by the best work of Evans' career. Bong has cast his film exceptionally well – including Bong regular Song Kang-ho as a drug-addled securities expert and Tilda Swinton, all-in, loony-bin brilliant as a fanatical mouthpiece for the ruling class — and all the actors have screen presences forceful enough to round out frugal characterizations that, by design, have but a single goal. The revolutionaries' mission? To seize the engine, manned by the train's designer and godhead Wilford. As Curtis and his ragged band of insurgents set off to meet the wizard (and ideally slit his throat), the story advances with a video-game-like plotting, each railcar representing a new level with a new challenge. Bong and Masterson subtly contour the film with religious iconography — in the bitter irony of its step-into-the-light trajectory (the benighted rebels are blinded by sunlight when they reach the more affluent railcars); the emphasis on the train's powerhouse as the "sacred engine"; an intriguing allusion to transubstantiation; and mirroring versions of a supplicant-and-divine-leader relationship, between Swinton's Mason with the enigmatic Wilford (Ed Harris), and Curtis with his steerage-class sensei Gilliam (John Hurt). Snowpiercer is not showing in any theaters in the area.